Miscellaneous Musings: The Female Barack Obama? I'm not going to comment on Attorney General Jeff Sessions' answers to questions about the Russians at his Senate Intelligence Committee hearing, or his recollections of meetings with Russian officials. Because he offered neither. I'm instead going to comment on the star of the hearings, U.S. Senator Kamala Harris of California. Kamala Harris became a rising star in the falling Democratic Party the second she was elected to the U.S. Senate in November 2016. A tough prosecutor of South Asian and Jamaican descent, she served as District Attorney of San Francisco and then as Attorney General of California and was known for her tenacity and her lack of moderation in the pursuit of justice (such moderation, as Barry Goldwater once told us, is no virtue). She's brought that no-nonsense attitude to the Senate, grilling witnesses in the Trump investigations such as Jeff Sessions to get to the heart of the matter. But she's had a hard time getting her questions out; Senate Intelligence Committee chairman Richard Burr (R-NC) keeps cutting her off. Now why is that? Because she's a woman? Because she's a person of color? Or is it because Republicans are afraid of her aspiring to a federal elective office higher than the Senate? 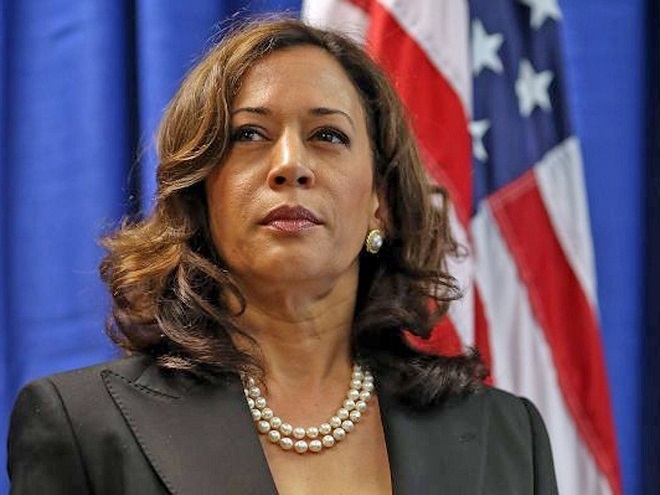 I'll come right out and say it - Kamala Harris is being talked about for the Presidency in 2020. And Burr and other Republicans may be trying to silence her because they see her as a threat down the road. She's a dream candidate for many Democrats, someone who could forge a new coalition of women, people of color, and white male liberals, and maybe drawing in the same Trump voters in the Rust Belt who had voted for Barack Obama in 2008 and 2012. Indeed, she is seen as a female Obama - biracial, educated abroad (she lived in the Canadian province of Quebec as a teenager), liberal on social issues, a seasoned lawyer, and a first-term U.S. Senator. She's also married to a lawyer, California attorney Douglas Emhoff. As a presidential candidate, she'd be unstoppable. But as President? Well, that's the problem. She'd come into office with the same drawbacks as Obama. While she has more state and local government experience than Obama had before he entered the Senate, she will by 2020 have only been in the Senate for four years, like Obama, and she'd likely enter the Presidency as unfamiliar with Washington as Obama proved to be. How could she get things done? And how effective would she be at building up the Democratic Party? These questions about Harris need to be answered. I would expect her to be more effective than Obama as a President and as a party leader, if her relentless grilling of Sessions is any indication. But is this another play by the Democrats at identity politics, which Obama eschewed, preferring to be the candidate who happened to be black, not the black candidate - but which Hillary Clinton, as a woman, so shamelessly exploited to the detriment of the party and her own career? If the answer is yes, then Harris would be wise not to take the bait and not to run as "the non-white female candidate." Because playing with identity politics is the same as playing with fire, and when Hillary played the "gender card," she, the Democrats, and the whole country were burned. But don't count out Kamala Harris in 2020. She could be a formidable presidential candidate then and scare the Republicans silly. Guys like Burr understand that.